Here at the MHK we enjoy many food related television shows, including Diners, Drive-Ins and Dives, which showcases small restaurants around the country that are local favorites. During our trip to California, we decided to visit one of the places that was featured on the show a couple of years ago – Gloria’s Cafe. Located on Venice Boulevard in West L.A., this fairly tiny spot hardly stands out at all in the small strip mall in which it’s located. The food, on the other hand, stands out tremendously. 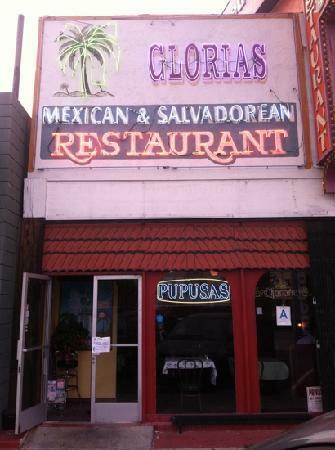 The restaurant’s namesake is Gloria Flores, who moved to L.A. from El Salvador 45 years ago with the dream of opening a Salvadoran restaurant. But in order to make the food more accessible to the Los Angelenos, she began by doing Mexican staples like tacos, enchiladas and burritos. But gradually she began working Salvadoran food into the menu, and now it’s her homeland’s food that takes center stage. The restaurant is bright and welcoming, with very friendly staff. I spoke with our server about how being on Diners, Drive-Ins and Dives had affected their business. She said after the show aired, business skyrocketed so fast that for a short while they could not keep up with the customers and even ran out of food some nights. Things have settled down now, but their baseline business is far higher than it was previous to being on the show. You can check out their segment here. The menu is large but not out of control, with Salvadoran dishes like papusas, various marinated steaks, pork chops, and chicken dishes, along with several soups and seafood items. 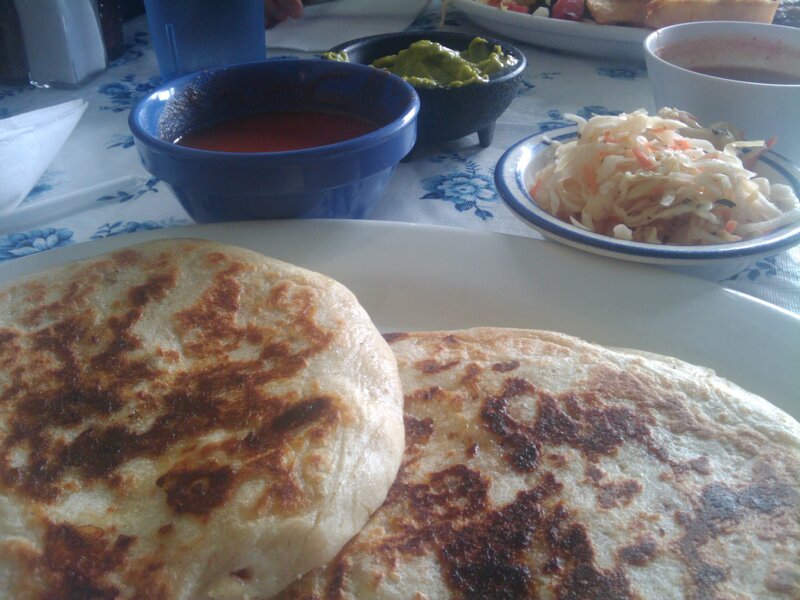 We started with a four kinds of papusas, which are pillows of masa dough stuffed with a variety of fillings. Gloria’s offers pork and cheese, herbs and cheese, beans and cheese, and just plain cheese. They were all delicious – the dough was light and tender, and the fillings were seasoned nicely and oozed out in a very appetizing manner. They were served with a pickled cabbage slaw and a medium-spicy red salsa – it was a great combination when the slaw and salsa were eaten with the papusas, blending the savory fillings with the sweet and salty slaw and spicy salsa. For entrees, we stayed on the Salvadoran side of the menu, eschewing the Mexican items as we could find those more readily at other places. We ordered the carne adobada, the tampiquena, and the Seven Seas soup. 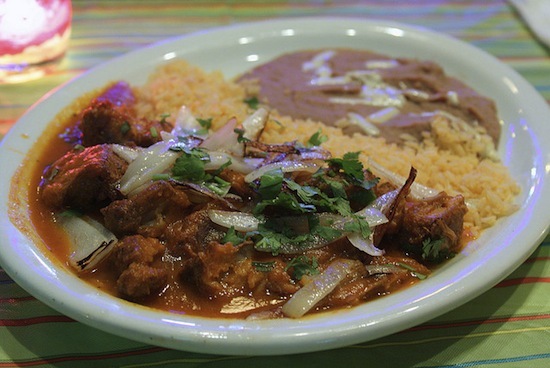 The adobada featured chunks of marinated pork, slow-cooked in an incredibly flavorful sauce. The pork fell apart at the slightest pressure from our forks, and the roasted onions added some nice texture. It was served with rice and the best re-fried beans I’d ever had, along with corn tortillas to scoop up the pork and sauce. It was extremely delicious. The tampiquena was a nice cut of marinated steak, served with a cheese enchilada with salsa verde and guacamole. The flavor of the steak was absolutely divine – lime, pepper, and other spices came through in a beautiful way. The enchilada was good, particularly with the salsa verde. The only disappointing component was the guacamole – it was as smooth as paste and was fairly bland. 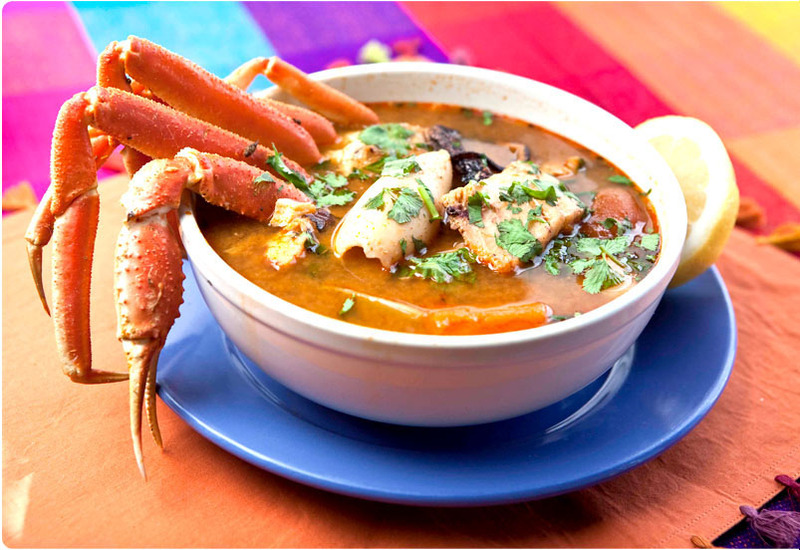 If you like seafood at all, then the Seven Seas soup will make you very happy. A giant bowl was filled with an aromatic and well seasoned broth, housing fish filet chunks, shrimp, scallops, octopus, calamari, and crab legs. All of the seafood was cooked perfectly, and the broth was fantastic. With many other dishes that looked very inviting, a return trip to Gloria’s will definitely be required. If you watch the video clip, you can see how the adobada and the Seven Seas soup are prepared. Unique and delicious, it’s worth a trip to Culver City. The Mouse House Kitchen gives Gloria’s Cafe 4.5 out of 5 stars!